The Cottage Grove Lions Club, St. Paul Park/Newport Lions Club, Cottage Grove Crime Prevention Board, Minnesota Fraternal Order of Police Lodge #1, Cottage Grove Strawberry Fest and the Cottage Grove Dept. of Public Safety are sponsoring this fundraiser to help the Mackal...l Family. 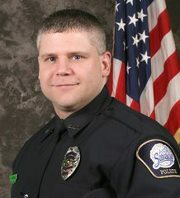 On Jan. 2nd Frank was responding to a prowler call while working as a Police Officer for the City of Savage. The car hit a patch of ice and spun out of control. Frank was seriously injured and spend 84 days in the hospital at North Memorial. Frank and family live in Cottage Grove. Prior to becoming a police officer Frank was a volunteer for the Cottage Grove Police Department Reserve Officer Program. His wife, Lisabeth has made the decision to leave her career as a Rehab Director to assist with Frank's recovery at home. Leaving that full time position has left a financial strain on Frank, Lisabeth and the kids. If you cannot attend please consider sending a donation to the Cottage Grove Lions Club at Box 002, Cottage Grove, MN 55016 C/O Frank Mackall Benefit. All you can eat Brats, Hot Dogs, Chips and soda. Live music, kids events and raffles. Beer will also be sold at the event.